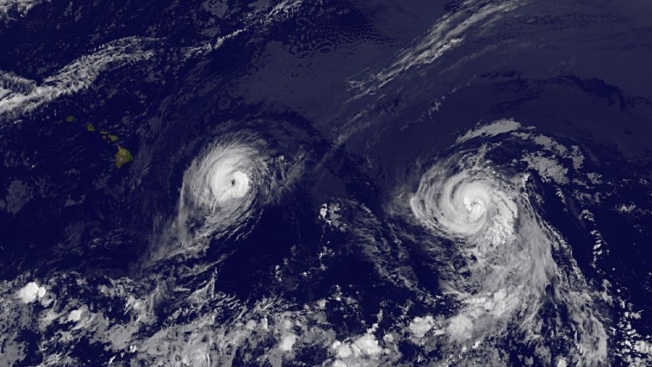 This image provided by NOAA taken Thursday Aug. 7, 2014 at 2 a.m. EDT shows Hurricane Iselle, left and Hurricane Julio. Iselle was supposed to weaken as it slowly trudged west across the Pacific. Federal forecasters say the Atlantic hurricane season will be even quieter than predicted, thanks to atmospheric and oceanic conditions suppressing storm formation. The National Oceanic and Atmospheric Administration still expects three to six hurricanes to form during the six-month season that peaks between mid-August and mid-October. Officials dropped the number of named storms to between seven and 12 in an updated hurricane season forecast issued Thursday. The forecast calls for zero to two of those hurricanes to be major storms with winds greater than 110 mph. Forecasters say there remains a 70 percent chance that the season will be less busy than normal. A normal year has 12 named storms, six hurricanes and three major storms. There have been two hurricanes so far this year, Arthur and Bertha.